The offshore drilling industry is showing clear signs of recovery concentrated in a few segments. With one notable exception, dayrates remain too low for companies to generate much in the way of cash flow from new contracts. There appear to be signs that E&P companies have cut back somewhat on offshore spending in response to lower oil prices. Investors should remain cautious on any company in the offshore drilling industry. It has become something of a tradition for me to publish regular monthly updates on the utilization and dayrate trends in the offshore drilling industry. These are two very important determinants of profitability for the companies in the industry as these are the measures that tell us how much money firms can expect to generate from their fleets. As is usually the case, the raw data for these updates comes from the Offshore Rig Day Rate Trends report that is published by leading industry consulting and analytics firm IHS Markit on a monthly basis. Curiously, the firm skipped the February dated report (which should have been published in mid-March), so I was unable to publish an update last month. However, the March data was published late last week, so let us have a look at the conditions in the offshore drilling industry as of the current date. As is always the case, IHS Markit has focused on four specific offshore markets that it believes serve as a good proxy for the industry as a whole. For the most part, these selections do represent effective proxies, which will be discussed in each of the following sections. In aggregate, though, we do see some very real signs that the industry continues to heal although the end of year drop in oil prices a few months ago may be having an impact here. The first type of rig that has its dayrate and utilization trends tracked by the IHS Markit report is ultra-deepwater semisubmersibles. These are defined as semisubmersible drilling rigs that are capable of operating at water depths greater than 7500 feet. A semisubmersible rig is a self-propelled floating platform that has the majority of its structure under the ocean surface while the deck remains above the water. Once at the drilling site, the rig is held in place using a combination of anchors and heavy ballast, which provide it with a great deal of stability in choppy water conditions such as are often found in the North Sea or the Arctic Ocean. The stability of these rigs also makes them good for development work as the ability to remain in one place is quite vital. As we can see here, the utilization rate increased slightly in the month of February. This means that the percentage of rigs that are operating under a contract during the month went up. This could have been caused by either an increase in scrapping activity or an improved number of contract starts, both of which things have been occurring over the past several months. Either cause is actually a net positive for the industry since one of the biggest problems that has been plaguing the industry is an oversupply of rigs. 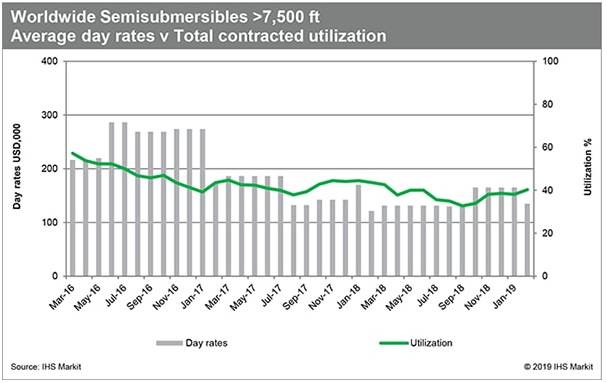 An increasing utilization rate represents a declining oversupply, which should ultimately prove positive for dayrates. Unfortunately, we did not see this in the past month as the leading new contract dayrate plunged significantly. It currently sits at levels that it has not seen since last September. As I have discussed in previous articles, the leading new contract dayrate is barely above cash flow breakeven levels, meaning that drilling contractors are unlikely to produce much in the way of cash flow from the new contracts that they do receive. This will unfortunately result in the companies operating these rigs continuing to limp along until the utilization rate improves significantly. 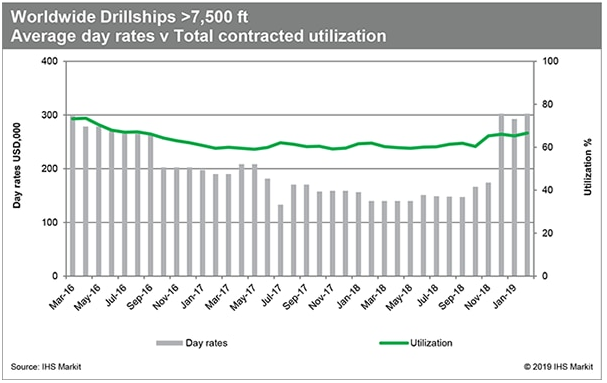 The second type of rig that has its dayrate and utilization trends tracked by the IHS Markit report is ultra-deepwater drillships. As with the ultra-deepwater semisubmersibles, these rigs are capable of operating in more than 7500 feet of water. Where these rigs differ from the semisubmersibles is in their hull design. As one might expect from the name, a drillship is a ship (some are converted oil tankers) that has been specially equipped to be able to drill oil and gas wells. Their ship hulls give drillships much greater speed and maneuverability than a semi-submersible, making them ideal for exploration work where there is a need to drill multiple wells in an area. However, these rigs are not as stable in harsh conditions as their semisubmersible cousins, so they are not seen as much in those environments. For the most part, the utilization rate for the world's ultra-deepwater fleet has held up much better than that of their semisubmersible cousins throughout the downturn. As we can see above, the utilization rate for these rigs has remained right around 60% over most of 2017 and the first nine months of 2018. However, it jumped a bit at the beginning of the fourth quarter and has remained steady since then. This is a good sign as clearly some of the formerly unemployed rigs have returned to work, indicating that more companies have begun hiring these rigs to further their offshore plans. However, despite the improvement in utilization that we see here, there are still a substantial number of unemployed ultra-deepwater drillships around the world, which will likely keep dayrates suppressed somewhat. With that said, we did see a significant improvement in dayrates for these rigs over the past three months. As we can see here, dayrates jumped to around $300k back in December and have hovered around that level ever since. This would put the most recent datapoint at the highest level that it has had in three years. Another nice thing about this dayrate figure is that $300k a day is well above the cash flow breakeven level as companies like Pacific Drilling (PACD) boast operating costs around $110,000 a day across their drillship fleets. While these higher dayrates are nowhere close to the levels that were reached in the early part of this decade, it is still nice to see that the companies operating these rigs should be able to turn a profit with dayrates at their present levels. The third type of offshore drilling rig that has its utilization and dayrate data presented in the IHS Markit report is the harsh-environment jack-up. As the name implies, these are jack-up drilling rigs that have been specially reinforced to operate in some of the harshest environments known such as those in the Arctic and on the Norwegian Continental Shelf. This may be why the consulting firm's data only covers those rigs operating in Northwest Europe and does not consider those rigs that are operating elsewhere in the world. However, the overwhelming majority of harsh-environment jack-ups are found in the waters of Northwest Europe, so this is a reasonable proxy for this particular market. Unlike the case with the ultra-deepwater units, in this case, the data is not for the newest and most capable harsh-environment jack-up units. Instead, the data presented is for standard units, which are jack-ups that are only capable of operating in water depths of less than 361 feet. This definition would, therefore, exclude the more capable rigs operated by Seadrill (SDRL) and a handful of other small contractors in Norway. The majority of harsh-environment units are standard ones, though, so the data would still include the majority of the harsh-environment jack-up fleet. Therefore, this appears to be an acceptable proxy to analyze the market for these rigs. The harsh-environment segment of the industry has recovered much more rapidly than any other, due at least in part to the large investments that Equinor (EQNR) was making in Norway last year. As we can see above, the utilization rate improved greatly over the second and third quarters of last year and has remained relatively solid since that time. While it did have a bit of weakness in the fall and winter months, it has since rebounded with oil prices this year and currently hovers at just below 80%. The 80% level is historically the point at which dayrates begin to get pressured upwards since there is very little oversupply to keep dayrates suppressed. However, this did not happen as dayrates remained almost totally flat despite the surge in utilization. This clearly indicates that the upstream oil companies remain firmly in control of the market, which may be due to there only being a small number of firms contracting these rigs. Unfortunately, though, this puts us in the same situation as we saw with the ultra-deepwater semisubmersibles in that dayrates are barely above cash flow breakeven levels for most of these rigs, which severely limits the amount of profit that a contractor can expect to generate off of one of these rigs. 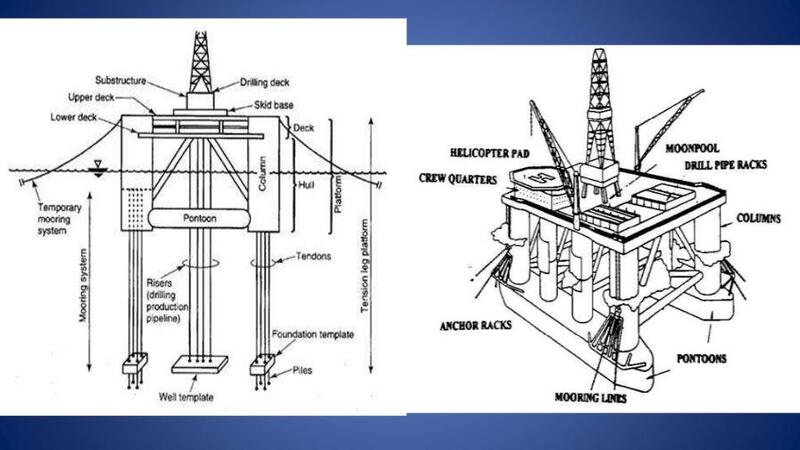 The final type of rig that has its utilization and leading new contract dayrate tracked by the IHS Markit report is the high-specification jack-up. For our purposes, a high-specification jack-up rig is an independent leg cantilever jack-up unit that has a maximum operating water depth of 361 to 400 feet. For the most part, this would include most shallow-water rigs of recent generations. The exceptions would be the handful of rigs that are more capable than this, such as Rowan's (RDC) Gorilla-series. Overall, though, this data should cover enough of the current rig generations to give us a good idea of what the market for benign-environment shallow-water rigs is doing. As was the case with the harsh-environment jack-ups, IHS Markit chose to focus on only a single region of the world when compiling the data. In this case, the region chosen is Southeast Asia, which is historically the largest market in which these rigs are used. However, in recent years, there have been a sizable number of these rigs contracted for use in the Gulf of Mexico and the Persian Gulf. IHS Markit's data would specifically exclude the data on these regions. Nevertheless, the proxy should be adequate for deriving the overall trend. 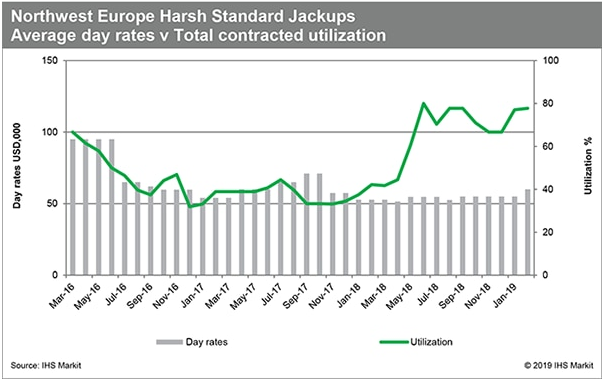 Here, we can see that the utilization rate for high-specification jack-up rigs has generally improved since the middle of 2018. This is generally a good sign since it means that the market is healing. However, the drop that we have seen so far this year should definitely be taken as a negative. One trait that shallow-water rigs have is that they serve as a leading indicator of the direction of the market partly due to their short contract terms. As a result, utilization will adjust very quickly to match current market sentiment. The drop in utilization here could indicate that exploration and production companies are reducing their spending on offshore environments due to the drop in oil prices, which could spread to other offshore segments and reverse the weak recovery that we have seen thus far. 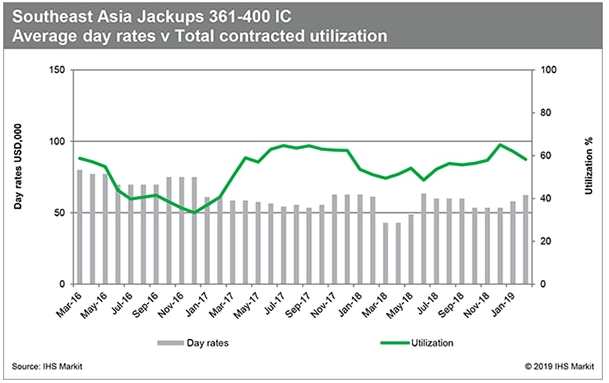 We do see that the leading new contract dayrate for these rigs has been increasing over the past two months, but it is questionable whether this is sustainable or not. The reason for this is that the most recent dayrate is no higher than it was at the beginning of last year, and the development between the two dates was not especially good. We also see that despite the improvement that we have seen in the past two months, the leading new contract dayrate is right around the cash flow breakeven level for most of these drilling units. As is always the case, this will greatly limit the amount of cash flow that rig owners will be able to derive from the new contracts that they are awarded. In conclusion, there are definitely some signs here that the offshore drilling industry is healing. This is particularly evident in certain sectors such as the harsh-environment one. At the same time, though, we see signs that some of the industry's customers have become more cautious with the lower oil prices and may be reducing spending. This development will drag on the industry going forward. Unfortunately, we do not see strong signs that the industry will deliver cash flow growth in the near future, so investors should be cautious with any of the companies in the industry. Disclosure: I am/we are long EQNR. I wrote this article myself, and it expresses my own opinions. I am not receiving compensation for it (other than from Seeking Alpha). I have no business relationship with any company whose stock is mentioned in this article.